Announced in 2006, Trump SoHo New York or just Trump SoHo will be a $450 million, 46 story, 391 unit hotel condominium. The building is located at 246 Spring Street, between Varick Street and Sixth Avenue, a few blocks west of the SoHo neighborhood in New York City. This is a region zoned for manufacturing, which precludes permanent residences. 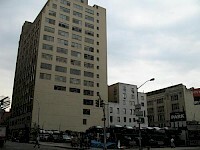 The condo-hotel design was approved after negotiations with New York City Mayor Michael Bloomberg.